In the olden days, i.e., before the development of intraocular lenses (IOLs), people had to wear special contact lenses or very thick eyeglasses to be able to see after a cataract surgery, since no device was implanted in the eye to replace the focusing power of the natural lens. With the development of intraocular lens, several types of IOL implants are available to help people enjoy improved vision. Intraocular lenses (IOL) are medical devices that are implanted in the eye in order to treat cataracts or myopia. It replaces the eye's natural lens when it is removed during cataract surgery. Most IOLs are made of a foldable and flexible material that focuses the light coming into the eye through the cornea and pupil onto the retina, the sensitive tissue at the back of the eye that relays images through the optic nerve to the brain. Globally, growing aging population and lowering costs of cataract surgeries are drivers of intraocular lenses market. However, the high cost of advanced IOL’s is the key restraint for the intraocular lens market. This report identifies the global Intraocular Lens Market size in for the year 2014-2016, and forecast of the same for year 2021. 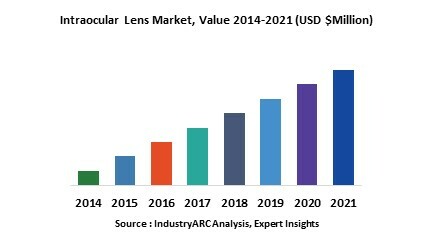 It also highlights the potential growth opportunities in the coming years, while also reviewing the market drivers, restraints, growth indicators, challenges, market dynamics, competitive landscape, and other key aspects with respect to Intraocular Lens Market. Geographically Asia Pacific dominated global Intraocular Lens Market, and is projected to have fastest growth followed by North America, Europe and Rest of the World (RoW). 11.2. Abbott Medical Optics, Inc.